Williams throws away an estimated 800 tons of material into the municipal solid waste stream every year, items which are either non-recyclable, non-compostable, and non-reusable, or mistakenly included with the above. Where do the trash leftovers go? Williams’ trash is hauled to the Wheelabrator Hudson Falls energy-from-waste facility in Hudson Falls, NY, where it is incinerated. The waste is converted into a local fuel to generate electricity for sale to the local utility. Debris from construction dumpsters across campus goes to a landfill in Rensselaer County, NY. 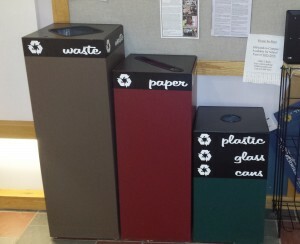 Starting early in academic year 2011, Williams has instituted a waste measurement system. In previous years, we collected data related to volumes of recyclables but not overall trash volumes. We have been working with our trash and recycling service providers to develop an online reporting system. We now have enough information for some of our waste streams that we are developing baselines that we can use to set ambitious goals.